Haters abound, and if they weren’t wrong then, they’re definitely wrong now: in 2017, the world of the NYC taco is expansive. Perhaps more than in any other city, you can find high-brow fusion tacos at fine-dining restaurants alongside low-brow cheap-eats style ones. While some of New York’s tacos are reminiscent of those found in San Francisco or Mexico City, others are totally unique to this city. It’s been a long road to NYC’s taco savvy. The first tacos are said to have been created by Mexican silver miners in the 18th Century. In the early 1900s, Mexican migrants came to work in mines and railroads in California and the Southwest, bringing their culinary traditions, including the taco, with them. Women dubbed “Chili Queens” sold tamales, tacos, and other street-food to tourists in the streets of San Antonio and Los Angeles. “I think that image of [something] exotic, slightly dangerous, but still appealing has really persisted with Mexican food,” Jeffrey Pilcher, historian and author of Planet Taco: A Global History of Mexican Food, told Smithsonian in 2012. Tacos have always been the site of an authenticity polemic. Mexicans first used the word “taco” only when selling the delicacy to non-Mexicans in the Southwest. Although enthusiasts fight over the most authentic ingredients and style, tacos are a constantly evolving food. Tacos al pastor -- stuffed with marinated, thinly sliced pork shoulder slowly roasted on a bell-shaped trompo, a sort of spinning top -- were invented by Lebanese immigrants to Mexico. They brought their famous technique of spit-roasted meat, usually lamb, with them, which is why tacos al pastor so closely resemble shawarma. When Mexican shepherds (al pastor means “in the style of the shepherd”) adopted the technique in the early 20th century, the beloved taco al pastor was born. 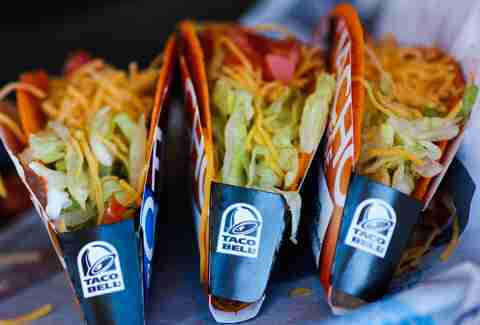 It wasn't until 1962 when tacos become a household staple in the U.S. That's when a Californian entrepreneur named Glen Bell decided to franchise a taco fast food restaurant, and Taco Bell was born. Taco Bell (and Chipotle, and other Mexican-esque chains) recreated the taco with ingredients typical of the American diet: “Hamburger instead of offal meat. Cheddar cheese, iceberg lettuce, tomato -- these are all foods that Mexican-Americans start to incorporate into their diet,” says Pilcher. Now, Americans eat more than 4.5 billion tacos every year, according to NBC News. We stuff them with beef, fish, pork, kimchi, bành mí, falafel, and veggies. We eat them for breakfast, lunch, dinner, and midnight snacks. There were two crucial turning points on the path to NYC becoming a taco town. The first was about 30 years ago, when southern Mexican immigrants started moving here in unprecedented numbers. The Mexican population of New York City has continued to grow in the last decade, making it the third largest ethnic group in New York City, according to a CUNY study. Mexican families settled in Brooklyn’s Sunset Park, Crown Heights, and Bushwick; Queens’ Elmhurst, Jackson Heights, Corona, and Kew Gardens; Manhattan’s East Harlem; and Staten Island’s Stapleton. Newcomers set up bodegas and taco stands to serve the food they had left behind in Puebla, and the nearby states of Guerrero and Morelos in southern Mexico. Instead of American-like ground beef, tacos were filled with chicken and bistec (steak), but also “cabeza (face), oreja (ear), and buche (esophagus and stomach),” writes Robert Sietsema for Eater. The second wave of taco change happened much more recently, when an influx of admired chefs began opening fine (or fine-ish) dining homages to the taco. Enrique Olvera, chef/owner of the famed Pujol in Mexico City, opened the supremely upscale Cosme in 2014. 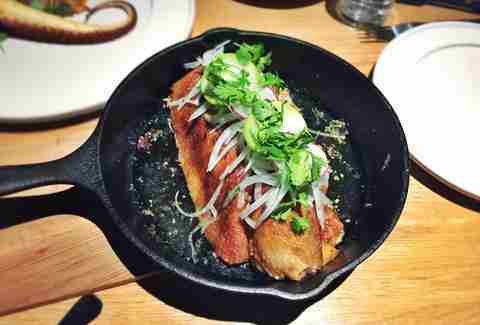 With it, he introduced a new kind of elegant and complex taco to New York: $89 duck carnitas made with tender duck that is seared, marinated in Mexican Coke, and shredded over a four-day process, before getting folded into warm house-made tortillas by diners at the table, DIY-style. New York has put down its own taco roots, but it’s still in the early stages of coming into its own. Olvera says he doesn’t go out for tacos here, ever. “Can you imagine a Japanese person searching for the best nigiri outside Japan?” he explains by way of comparison. The city has been figuring out its taco identity with plenty of experimentation. Chefs like Alex Stupak are bringing diverse traditions that have nothing to do with Mexico, like barbecue rubs, molecular gastronomy, and French techniques, to the New York taco scene. In 2011, a 30-year-old Stupak -- who had previously worked as a pastry chef at Alinea and wd~50 -- opened Empellón Taqueria in the West Village. It may have seemed like a strange move, but “going from modernist pastry to Mexican food, what I loved to eat most, was an attractive, compelling idea,” Stupak reflects. “I'm an outsider, a white boy from Massachusetts,” he adds. The food he cooks is inspired by Mexico, but he doesn’t call it Mexican -- “it’s not in my interest to copy.” His menu of tacos made with chicken wings, pastrami, and lamb tartare have helped him build an Empellon empire. After opening the taqueria, Stupak opened the more upscale Empellón Cocina in 2012, and Empellón Al Pastor, a laid-back bar/taqueria near Tompkins Square Park in 2013. Last month, he opened a Midtown flagship, Empellón, which, at 8,000sqft and 150 seats, is his biggest and most ambitious project yet. There he’s serving more inventive dishes, like a falafel taco with grasshopper hummus and Wagyu fajitas with peppercorn mole. At Cosme, Olvera churns out 2,500 tortillas a day from masa made with imported single-source landrace corn by the ancient Mexican process of nixtamalization. “Tortillas are vital,” Olvera says. “With a good tortilla you can make a wonderful taco just with a piece of avocado and a pinch of salt.” However, Olvera’s creations are rarely so simple. His menu may be “Mexican-inspired,” but he also uses local ingredients from the Hudson Valley and stuffs his tortillas with flavors from around the world, like black garlic-rubbed NY strip steak and fried shishito peppers. It’s not just these upscale takes that make New York’s taco scene so unique. It’s the fact that they exist alongside more affordable and traditional versions. Tortillería Nixtamal in Corona, Queens, grinds corn for its own masa. 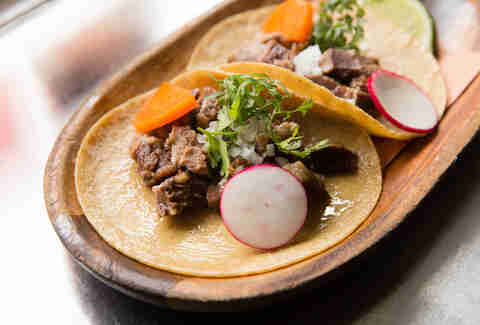 In Long Island City, Casa Enrique makes traditional lengua (beef tongue) tacos with meat that's slow-cooked and almost creamy. 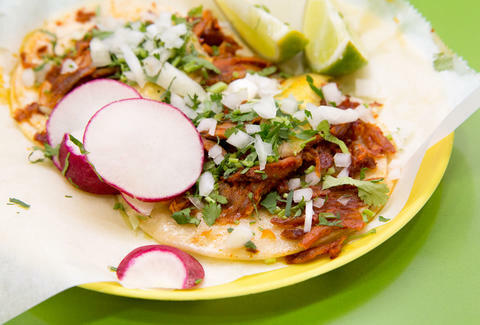 In Sunset Park, Brooklyn, there’s Tacos Matamoros’ porky chorizo tacos, Tacos El Bronco’s stewed head meat and chewy pig’s throat tacos, and Ines Bakery’s chipotle-drenched tinga tacos. For a great taco al pastor, there’s Taco Mix on 116th St in East Harlem. In Ridgewood, Queens, Guadalajara de Dia II is a grocery store that doubles as taqueria, and its pollo asado is somehow both rich and fresh. Los Tacos No. 1 in Chelsea Market makes its own tortillas and a balanced, zingy pico de gallo. Having such a strong base of the traditional alongside alternative, out-there variations is what truly makes New York a taco town. Despite plenty of skepticism, NYC’s taco creativity is thriving. “As more people start to wrap their heads around the taco as a blueprint for creativity and experimentation, we'll see even more exciting ideas take root,” says Jordana Rothman, restaurant editor at Food & Wine and co-author, with Alex Stupak, of Tacos: Recipes + Provocations. New York City-based chefs and entrepreneurs continue to build up NYC’s taco scene by melding tradition and innovation. A Manhattan-based company called Masienda has partnered with small farms in Mexico to provide high-quality Latin ingredients, like landrace corn, to chefs and home cooks. The Black Ant in the East Village and Toloache (with several locations around the city) both serve tacos made with grasshoppers. El Atoradero in Prospect Heights handcrafts blue corn tortillas with a custom masa machine and fills them with fragrant long-stewed carnitas. Hannah Howard is a food writer who lives in Brooklyn. Her memoir, Feast: True Love In and Out of the Kitchen, is coming out in 2018. Follow her on Instagram and Twitter.